Before I get started, I wanted to reply to Mike's (Troutrageous!) question about the lakes out here. We've had so much rain this year that all the lakes are within 15% of being full. They're not full because they are holding space for when the massive snow pack in the Sierra melts. So, I've come to the conclusion that if you have a flood, fish. You'll be the safest you can be. Yuki and I decided to try someplace besides North Shore Lake Camanche since it's been rather fishless out there lately. We met at Lake Amador out on the point where we've fished many, many times. It looks a lot fuller that it has in a loooong time. Unfortunately their hatchery fell to the drought just like the hatchery that supplies the Highway 88 corridor. So they started getting trout from the Mt. Lassen Trout Hatchery just like Lake Camanche does. 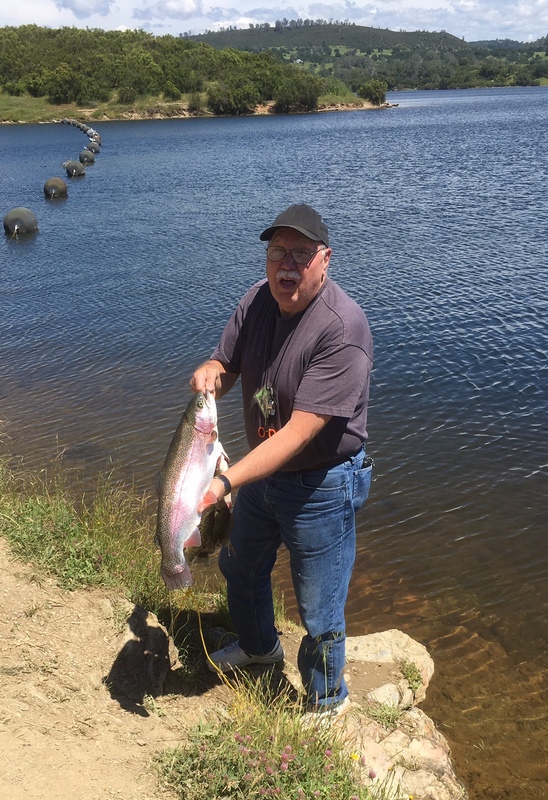 The only difference between Lake Amador trout and Lake Camanche trout is that Amador gets trout called Lightning Trout. Ever seen one? You are in for a treat. Put out one rod with rainbow Power Bait and started throwing Kastmasters. Nothing on the Kastmasters, but a nice bump on the Power Bait. To our surprise, it was a Lightning Trout. First one I've ever caught. I heard they were in Lake Amador, but had no idea they looked like this. One of our new friends next to us was nice enough to come over and net the fish. There was a drop of about 2 feet from were we were to the water and you needed a longer handle. So here is what a Lightning Trout looks like. Nice huh! Double click on it and it looks really big. About a pound and a half. Then Yuki got his first Lightning Trout. His a little bit bigger than mine about two pounds. We got a couple bumps each that we missed, then we sat for the rest of the day. I decided to call it about 1:00, go home and watch the Giants lose to the Dodgers. Should have stayed and fished. I packed up enough gear to make one trip up to the truck, but left my rods in the water. Back down to the lake for the rods and my tackle box and one rod started bouncing. Actually it was a little bounce. Well, maybe a rod tip movement, but I picked it up and sure enough there was a fish on. Our neighbor came over with his long handle net and scooped it up and boy was it a biggie. I tried to put it on the Handy Dandy Berkeley Digital Scale, but forgot to put new batteries in it the last time I tried (it has new batteries now) to use it. fortunately one of the other guys had a manual scale and the fish (a run of the mill Rainbow) came in at about 6 1/2 pounds. I happened to look at mine just after and it said 6 lbs. 6 oz. so I'll go with that. So I left at 1:00, Yuki stayed and caught one more, as did one of our neighbors. All in all, not a bad day. Just might have to go back out there again. Wow, Mark, that is a treat and a half for a day of fishing on a beautiful lake. Those fish are remarkable! Mark, that Lightening Trout is gorgeous. Do you know technically what it is? The rainbow ain't too shabby either. Nice day out. As far as I know it's a hybridized Rainbow. Google Lightning Trout and you can get a better understanding. Wow. What a day! And thanks for answering that question on the water levels. Glad to hear things are up again where they belong. I am sure I saw some of those Lighting Trout at one of our local hatcheries while on a visit there---they called it an albino, different names for different places I guess---speaking of names we call that size trout you landed here a pig. Whatever the name congrats on one special rainbow.